In his 2013 budget address a few months back, Mayor Nutter restated the administration’s commitment to moving the police headquarters from its current, cramped location in the Roundhouse, to the spacious but long-in-tooth Provident Mutual Insurance Company building at 4601 Market Street. The Provident is straight Central Casting for a police HQ, its imposing neo-classical frontage projecting an aura of authority, but also a certain reticence, out over its corner of West Philadelphia, as it has for over 85 years. With the relocation moving haltingly forward, it’s worth taking a look at the history of this monolith, and its uneasy relationship to the surrounding neighborhood, to see if lessons can be gleaned to guide the next phase of the building’s life. Provident Life and Trust Company of Philadelphia was founded in 1865 by a group of commercially minded Quakers and rapidly spread throughout the mid-Atlantic, eventually becoming one of the larger banking and insurance concerns in the region. 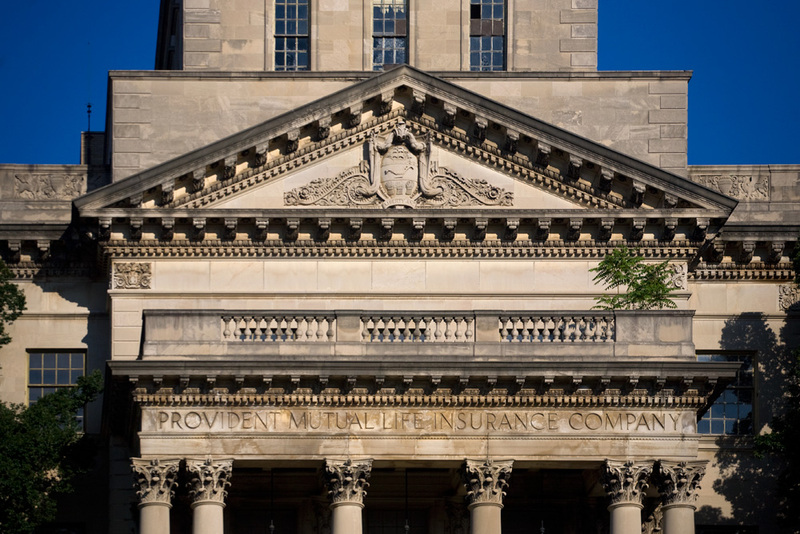 In the early 1920s, changes in state law required the separation of the banking and insurance arms of the company and a new company, Provident Mutual Life Insurance Company of Philadelphia was incorporated in December 1922. This new company immediately set about finding a new location for its headquarters, having outgrown its digs at 409 Chestnut Street, designed by Frank Furness in 1876 and demolished in 1960. Provident quickly decided on a 12.5 acre parcel at 46th and Market, previously part of the sprawling campus of the Pennsylvania Hospital for the Insane, known throughout the city as “Kirkbride’s” after the hospital’s longtime chief physician. In addition to providing room for the company to expand, the goal of locating the new headquarters outside Center City was to provide employees with opportunities for “daily relaxation” and exercise adjacent to the workplace, reflecting a mini-surge of interest in physical fitness in the 1920s. In what seems to have been almost an apology for the flamboyant Modern Gothic building that had been its previous home on Chestnut, Provident selected Cram & Ferguson, out of Boston, to design its new campus. The firm’s principal architect, Ralph Adams Cram, was one of the most famous of the day—he was featured on the cover of Time Magazine in December 1926—but was mainly known for churches and college buildings drawn from a pallet of traditional Gothic, Georgian, and Spanish Renaissance forms. True to form, Cram’s creation was long on gravitas, but architecturally rather staid. Facing 46th Street from atop a slight hill, the long, symmetrical limestone rectangle flanks an imposing central frontispiece with Georgian Revival Corinthian columns, pediment, and clock tower topped by a gold dome. Perhaps the most interesting feature of the exterior, a full-rigged ship weathervane rests atop the dome, the ship drawn from the Life and Trust’s seal. Three wings projected back from the main rectangle, forming a massive “E” when viewed from above. 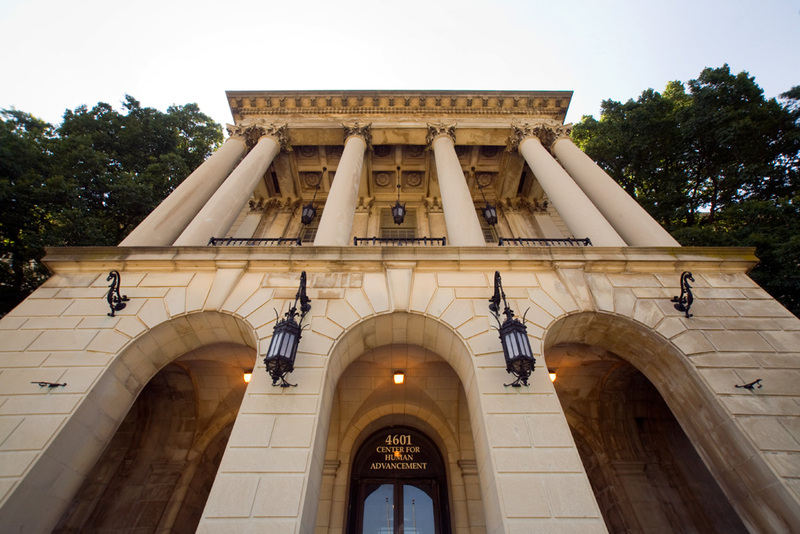 The building was constructed at a cost of $3,000,000, roughly $40,000,000 in today’s dollars. If the exterior was somewhat cautious, the interior was, and in parts remains, quite impressive. 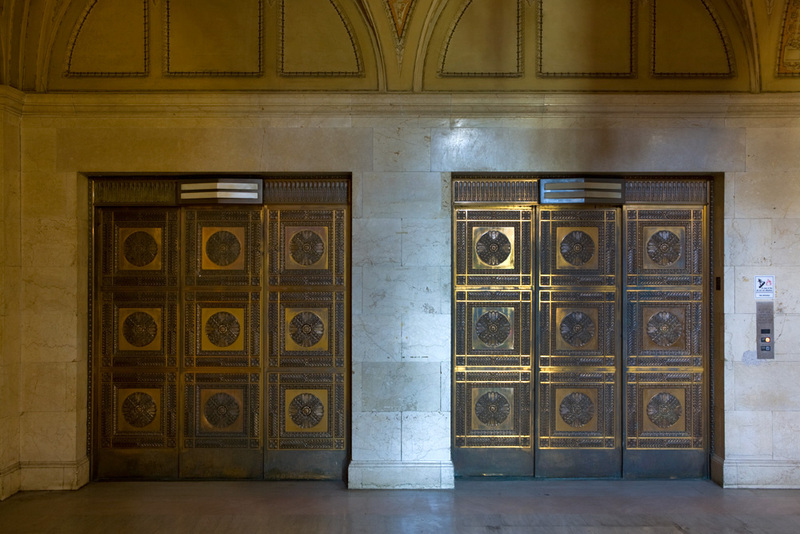 Massive bronze doors guard the entrance, and even today, nearly 90 years later, they swing open at a touch. 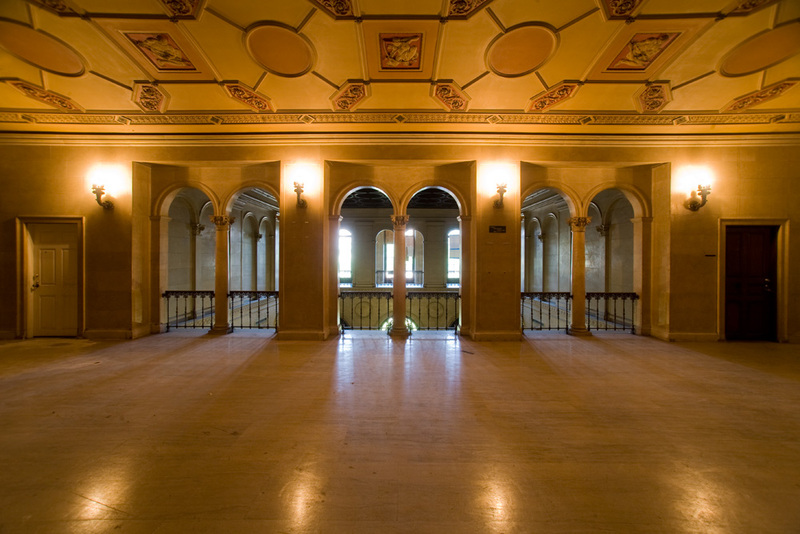 Just inside the doors, the building opens into a large lobby surrounded by an arched second story balcony, over which hangs an ornate coffered ceiling. 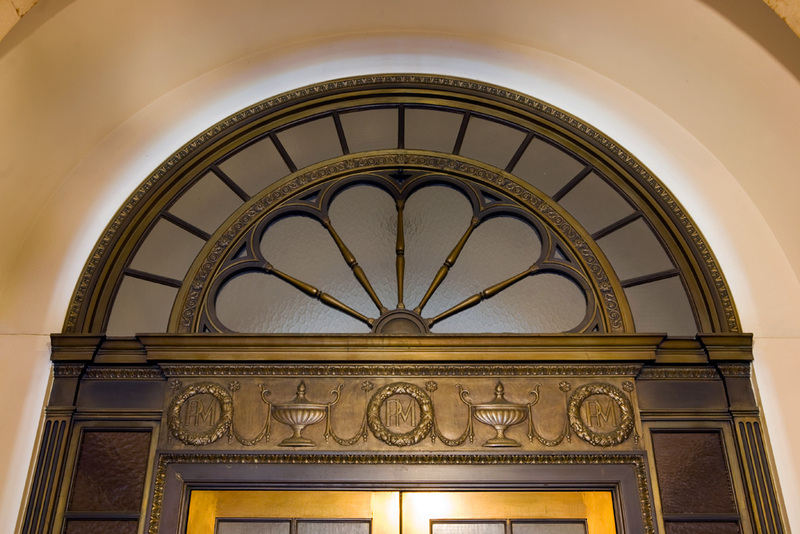 At the back of the lobby, an arched ceiling with classically themed plaster-reliefs sets off an elevator bank with bronze doors echoing the main entrances. The move to the new building was accomplished over Easter weekend in 1928, and on Monday morning the 532 employees of the Provident insurance department commenced work at their new office, which featured an indoor swimming pool, a baseball field, and tennis courts, as well as an 800 person auditorium. A cafeteria served free lunch to all employees. Provident’s move came just at the beginning of a demographic shift in the Mill Creek neighborhood of West Philadelphia in which the new building was located. In 1920, the area north of 46th and Market was largely white, with one in five residents having been born in a foreign county, and an African American population of about seven percent. Ten years later, even as overall population held steady, the black makeup of Mill Creek had grown substantially to twenty-six percent. This trend only increased, as appraisal maps in the 1930s redlined large sections of Mill Creek on three sides of the Provident campus, and white residents increasingly fled for the burbs. By the 1970s, the population was roughly half its pre-war high, and one of the poorest areas of the city, with over 40% of residents falling below the federal poverty line. Even as the neighborhood around it declined, business at the building on the hill was booming. After weathering a rocky decade in the 1930s, Provident Mutual grew steadily in the ’40s and ’50s, and by 1962 they had over 1,000 employees at 46th and Market. Needing more space, they filled in a courtyard between the northern and central wings of the original “E,” bringing the main building to its current 325,000 square foot size. The company continued to grow through the 70s and by 1980 had $11.3 billion of insurance in force and over $2 billion in assets. This rising prosperity seems to have raised the surrounding neighborhood’s ship little if at all. With 500 parking spots on site, the employees of Provident could, and often did, work, eat, and play without ever setting foot in the surrounding neighborhood. By the early 1980s, Provident had tired of its increasingly outdated and expensive home in West Philadelphia, and one suspects, though company literature was carefully circumspect, the urban decay surrounding its gates. Power networks crashed, updating data systems was all but impossible, and maintenance of the sprawling campus and building was running Provident $2 million dollars a year. The company announced its intention to move back downtown and pushed off in 1983, taking its 900 employees thirty blocks east to 1600 Market, where Skidmore, Owings & Merrill’s brand new 40-story tower welcomed them. Barely ten years later, the company would leave Philadelphia for good. An unusual medley of characters came together to write the next, albeit brief chapter in the life of the Provident building. On November 7, 1983, President Reagan announced from the White House that Provident Mutual would be donating the building to the Urban Education Foundation of Philadelphia, a nonprofit formed by Cheyney and Lincoln Universities. Fueled by generous grant infusions from all sides—not least of which a $30 million tax credit to Provident for the donation of the building—and glowing reviews for Reagan about his momentary attention to the black community, the Foundation sought to establish an institution of higher education in the building. The Urban Education Foundation apparently also found the hulking building to be beyond its means to manage, going belly up in 1991. From there the building narrowly avoided foreclosure before being purchased for $1.6 million by the Urban Education Development Research and Retreat Center Inc., a nonprofit headed by State Senator Vincent Hughes. For a time, the building served as a sort of West Philly community center and incubator, with over 35 institutions, nonprofit community groups, and small entrepreneurs occupying a portions of the massive building. Again with generous helpings of public grant funding and loans, Urban Ed, as it was known, managed to remain in operation into the mid-2000s. 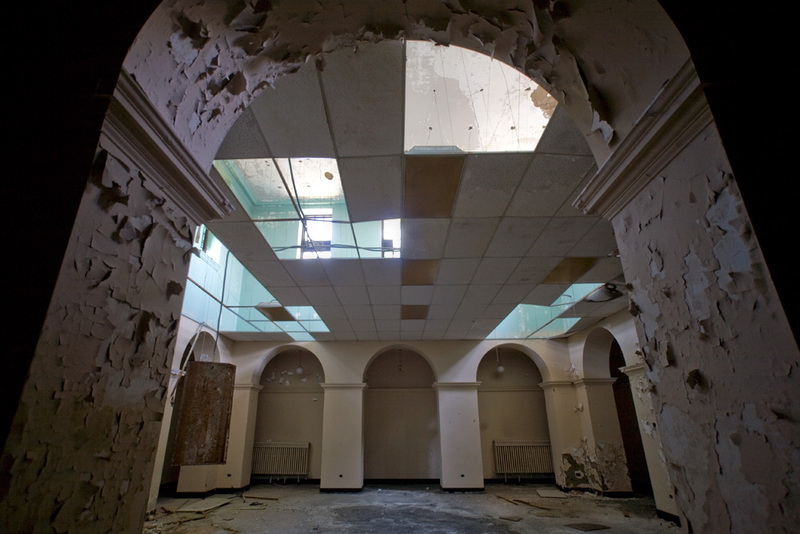 Sadly, the aging Provident eventually got the better of the Research and Retreat Center as well, and after initially selling a parcel north of the building to the City for the Youth Study Center in 2004, the nonprofit began seeking buyers for the main building itself. The campus was initially considered as a location for a new West Philadelphia High, but after negotiations fell through, and with no other buyers on the horizon, City Council directed the Philadelphia Authority for Industrial Development (PAID) to acquire the remaining property late in 2008. 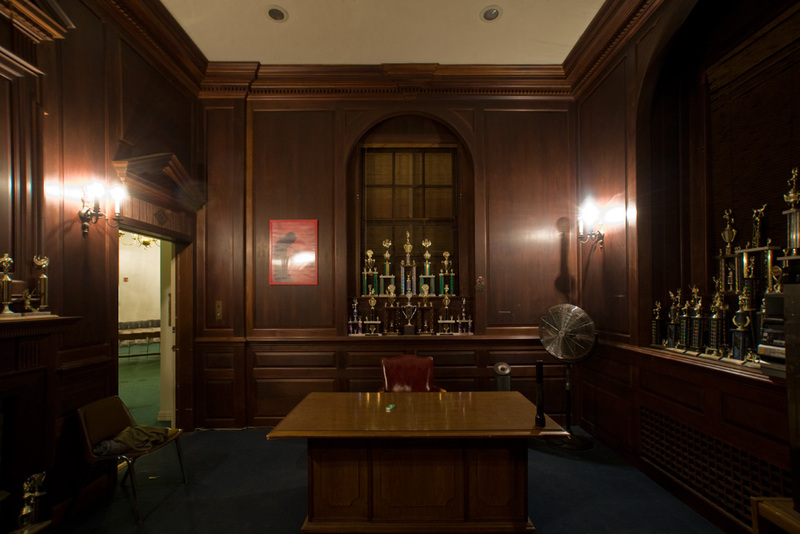 PAID paid off various Urban Ed creditors, wrote off a raft of defaulted loans, and took title on behalf of the City. The plan to establish a Public Safety and Public Health campus at a completely renovated Provident building was first floated by Mayor Nutter in 2008, included as part of a long wish list for Recovery Act funds. The plan was, and appears to remain, to consolidate the Police Headquarters, Medical Examiner’s Office, and various Department of Public Health offices currently spread throughout the city into a one stop shop accessible by car or the neighboring 46th Street El stop. 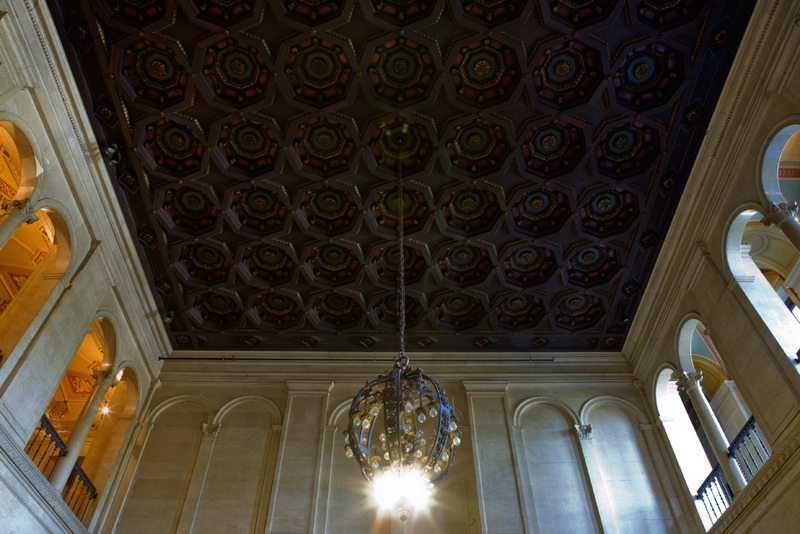 At the time, renovations were projected at $70 million. Today, the best guess puts the figure at closer to $200 million, only a small portion of which has been budgeted to date. Requests to the Mayor’s Press Office for comment as to the status of the project were not returned at the time of publication. Not surprisingly given the scale of the project and the various interests involved, the proposed move has drawn mixed reaction. Some area residents have expressed concern about creating a sort of siege mentality in the overwhelmingly black neighborhood, while others look forward to enhanced security and anticipated economic benefits. There are Save the Roundhouse partisans, Save Health 1 partisans, “it’s going to cost too much” naysayers, and folks concerned about spreading City health and safety functions across the city. Most everyone seems to agree that it would be good to see something done with the Provident, and that in all likelihood the only realistic reuse is for some municipal purpose. Beyond that, there seems to be little consensus. And so, a sort of stasis remains. 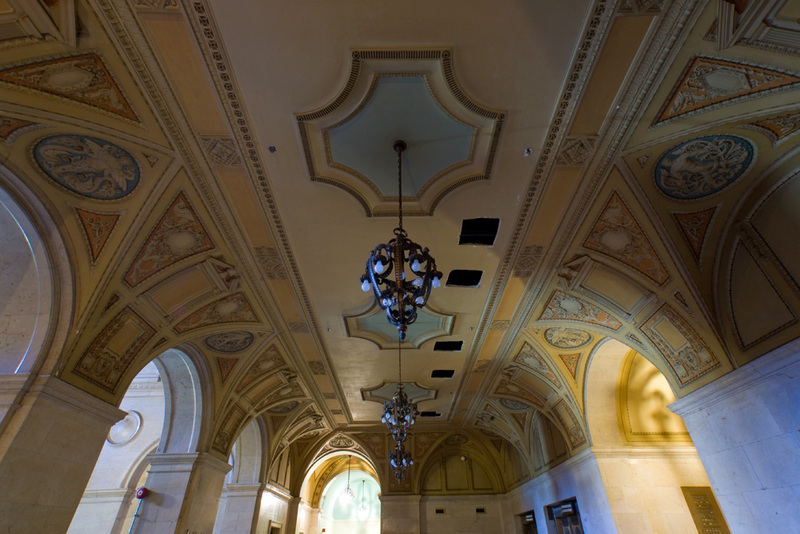 Outside the lobby, which is remarkably well preserved, few original details remain. 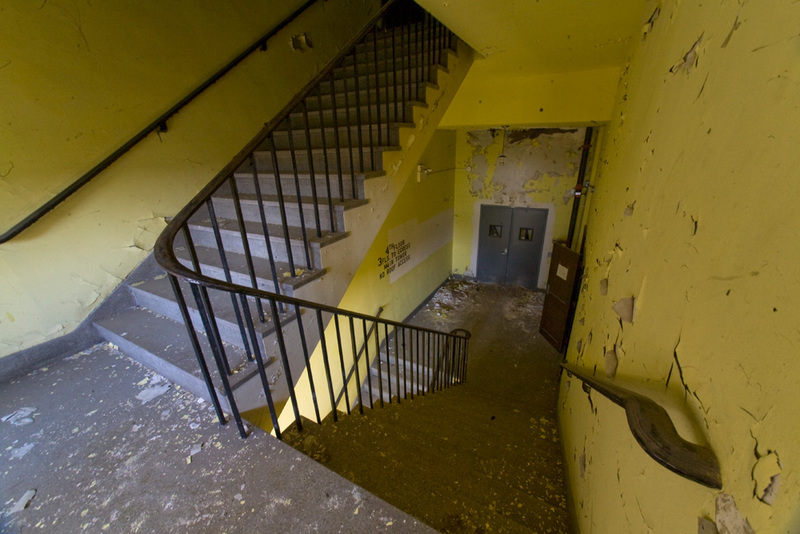 Much of the rest of the building, particularly the upper floors, is marked by a blandness wrought by layer upon layer of under-funded renovation, with sagging drop ceilings and peeling paint throughout, as well as a good deal of detritus left by various tenants over the years. In the basement, a massive bank vault hidden away behind a drywall partition and an antique elevator which used to securely ferry tellers down to make deposits are the only hints at the former use of the space. Other interesting elements of the building include the clock tower and cupola, accessible via a rickety winding staircase slowly growing impassable with bird droppings. The incredible view from the top is marred only slightly by the risk of hawk attack. If there is renovation or even planning work under way, it is not readily apparent, although there have been scattered reports of permits pulled and inspectors on site. As the Nutter administration legs out the back end of a second term, time would appear to be growing short for it to make the sort of commitment that would ensure the project’s completion, and an ultimate decision on the Provident may fall to the next Mayor, whoever that might be. While the details are worked out the Provident sits, as it has for the better part of the past century, an outsider in a neighborhood it has only occasionally found the means to engage. 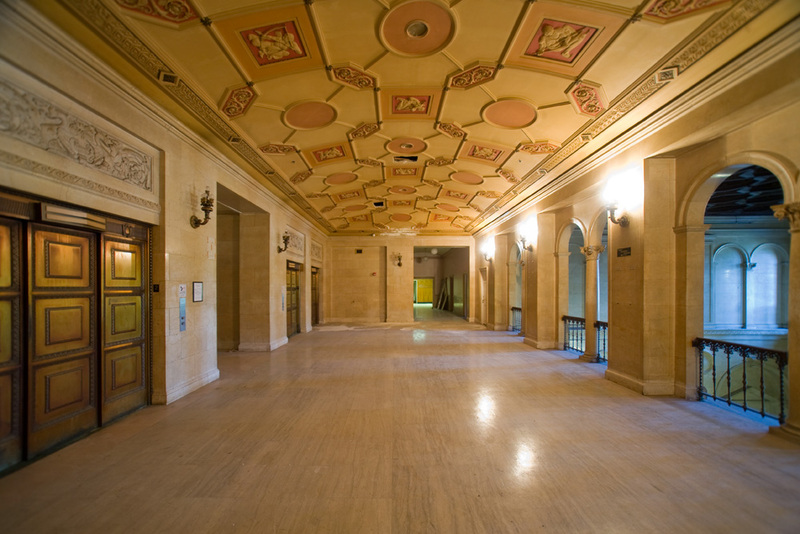 The author would like to thank Amanda Davis of PIDC and Monty Laws, longtime superintendent of the Provident building for providing a tour of the premises. 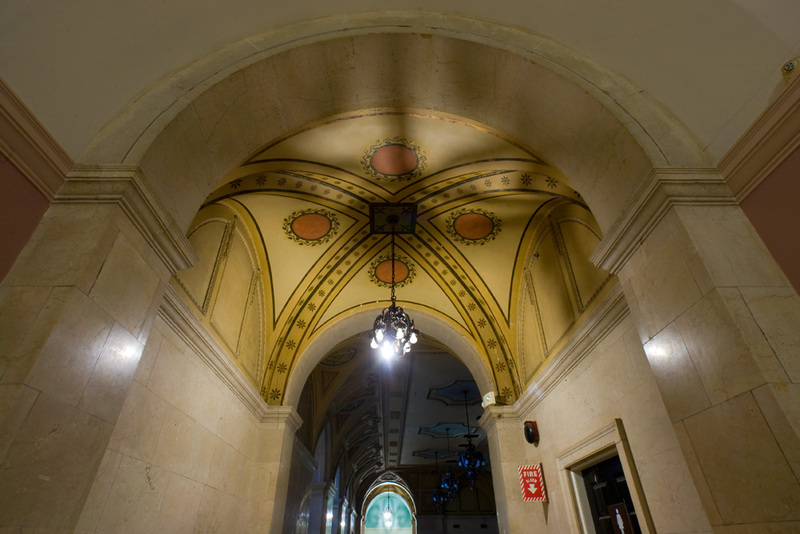 For more of Brad Maule’s Provident Building gallery, click any of the photos below. old buildings can be and lead to a moratorium on the destruction of other structures that either have historic value or simply are stunning examples of great architecture that just needs some polishing and some purpose. Think of it. That\’s the work of one of the greatest starchitects of his day. Now they are already virtually rebuilding the East Wing of the NAtional Gallery after 30 years.